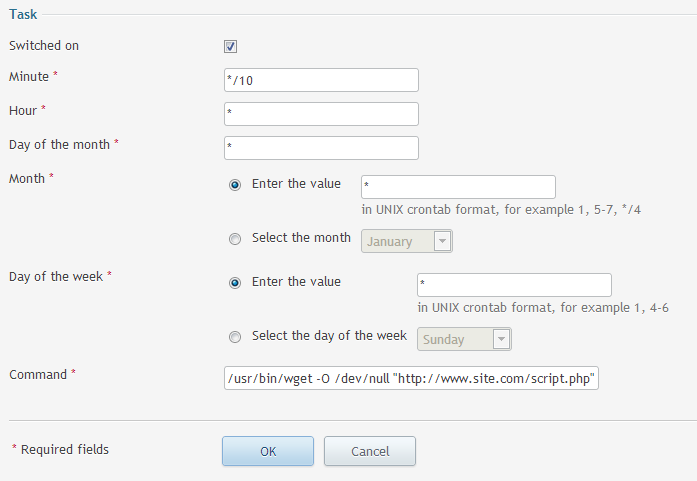 Setting up scheduled tasks or ‘cron’ jobs in Plesk is an incredibly useful feature. I’ve typically used scheduled tasks for MySQL database backups, automatic email notifications and twitter feed caching. After a bit of scrabbling around various internet forums and threads, I worked out that a couple of steps were needed to get a PHP scheduled task working on a Linux dedicated/VPS server using the Plesk control panel. Before you start however, double check that your PHP script works by running it direct from a browser. 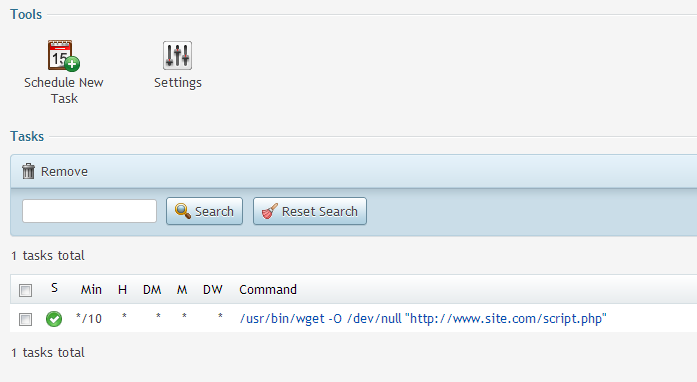 From ‘Websites & Domains’, select ‘scheduled tasks’ followed by the same system user we gave server access for in step 1. Select ‘schedule new task’ and enter the scheduled settings similar to the below, substituting site.com and script.php with the full path to your PHP script. I’ve found it more straightforward to use wget – a utility to download files from the Internet – rather than the PHP utility as PHP sometimes involves modifying the PHP script itself. If you want to have the scheduled task run at a specific time, enter the hour/day/month etc as a numeric value. Using ‘*’ means ‘all’ and using ‘*/’ sets an interval, so the above schedule will be set to run at 10 minute intervals every hour, every day of the week. /usr/bin/wget is the server path to wget and -O /dev/null tells wget to discard the contents of the file rather than the default behaviour of trying to save the file. But I don’t know how to get the successfully downloaded ‘null’ data into a usable file… Any light you can shed would be much appreciated. Thanks again for your very handy post. Hi Nick, ah yeah – /dev/null/ effectively deletes any output so your first method is probably the one to try and pursue. Sounds like an obvious question but have you enabled full write access ‘777’ on the target folder? Cannot write to `sampleresult.txt’ (Permission denied). Cannot write to `sample.txt’ (Permission denied). – You could also try creating an empty .txt file and setting the permissions of that if you haven’t already. Looks like this page is the only one which mentions the SSH thing. I’ve been looking for this for hours, literally. Thanks a lot! I love you. I LOVE you! Thanks. Thank you very much Mr. Tom Elliott. I have been searching about scheduled task but couldn’t find the correct “Command”. Its really a good article. You have mentioned every point very well.